Jypyä Pop (Turku, Finland) on 2 July 2012 in Lifestyle & Culture and Portfolio. Sunday was a good market day. It was beautiful weather and had a lot of people on the move. Many merchants showed a small busy, purchasers of the booth surrounding all the time. A great event. @rem_la: In this market, can imagine living in an old, past time. A number of small plays, which contain the voluntary actors tell about old events, and methods. A lovely capture of this interesting looking place. @Arash: Turku is Finland's oldest city. Age as it is almost 800 years. 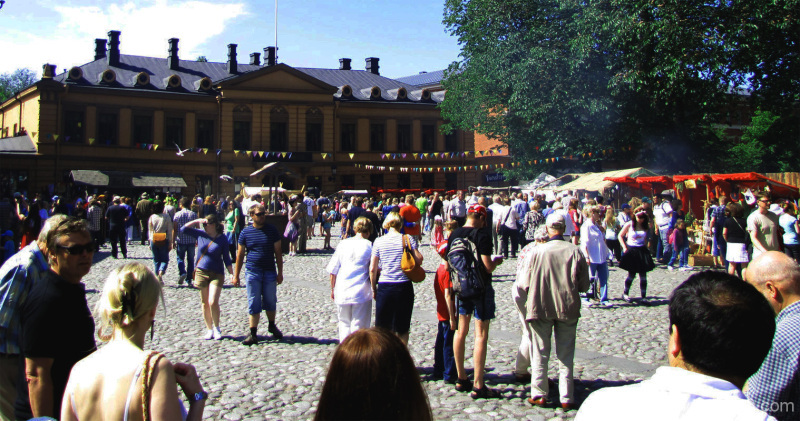 This market is celebrated in the historic center of Turku, Turku, close to the cathedral, which is derived from the 1200's. That is sooooo unfair! When I still lived in Finland, it was always raining when I wanted to go to see the Medieval market and now that I'm here the sun is there! @ursulakatariina: I want to help you with this pain. When the evening was going to go to the yard on a chair to sit and enjoy the fresh air, it started to rain. So, yes that weather can still act up. An excellent market scene. I like the stone street. @Steve Rice: Thank you. Many people have argued that these stones should be replaced by other coating. Difficulties in the movement have reduced mobility. Yet it has not been taken. Hope to come up with a compromise that allows all to be almost satisfied. Beautiful and busy market scene. The cobblestone street looks very interesting! @Stephen: It is old way do street. Kiva kesäinen päivä ja mukava kuva! Näitä aurinkoisia päivä tässä on odoteltukin. @Kristiina: Kesä käy täällä silloin tällöin. Sunnuntaina se viihtyi melkein koko päivän. Summer is here once in a while. On Sunday, it stayed most of the day. Que de monde sur ce marché!!!!! !belle compo! A wonderful market scene . Looks like everybody enjoyed the warm sunny weather. @Laurette: Thank you. It is a very popular event. It is sold in a wide range of products made the old way. The program of plays and musical performances during the Middle Ages and well-known figures moving in the audience. All the actors are volunteers. Superb photo of the place ! @tataray: It was beautiful Sunday. Amazing shot, well done. Have a lovely day & Good luck !!! quel monde quel cadrage et captage, sueprbe. @Nicou: On Sunday it was beautiful weather. It was fun to go on the market. Turku looks as though it has a lot of popularity, you must get many visitors. @Curly: Yes Turku is popular place. Here visit lot tourists and here is lot to watch. Welcome. A busy scene full of color. I like seeing images of local life.